Orenda: Life under a purple parachute - Sept 3rd & Sept 11th 2013. Well, it’s day two on location in a new life and I find myself back in Wales waiting for a meeting to start. In Starbucks with time to think. Yup, don’t let that pass you by, I seem to have some time to think. 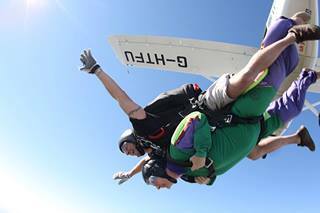 I was going to write a labouring analogy between jumping from a salaried job on Friday and jumping from a plane on Saturday but I have abandoned that after a conversation today to make a call out for thought contributions. So, try this instead. A different analogy. Imagine the human services context as a landscape. Got it? Think about all the stuff that’s going on in that context and then design your landscape to match. Keep it in your head, I don’t need to hear it. One analogy is as good as another. Right now look out across your landscape to our current leaders. Give them a physical space and presence and imagine them into a form if it helps. Can you see them? Hopefully they look vibrant and strong? Think about the current policy context and then re-imagine the landscape and those leaders in 10 years time. What form do they take now? If they are still good, strong and thriving then this thinking is a bit “previous”. If they are a little wilted go back to re-imagine the original landscape you created. How many green shoots did you see in your imagination? You can see them now of course but were they there before? Is there a gardener? Who’s tending the shoots? What preoccupied me last week was how current leaders, in which I belatedly include myself, are going about developing future leaders in human services? I like to over-egg everything. It irritates some but it helps me to see complicated issues clearly. Oversimplification is not of course reality, but there’s a little enjoyment in parody if not a smattering of truth. I started imagining three roads to the future. One builds a road out of money. The money is everything. Those that succeed are those most willing and able to make cuts, tackle efficiency, focus on hours of delivery and maximise output from minimum input. Those able to do that best are the fittest and they survive. Some on the road fall by the wayside. They are the ones who get weary of walking, they’ve forgotten where or why they were going . The journey is the purpose. Winning is for winnings sake. The second road comes from the past. People on the road hold tight to the principles we grew up with. They get to be angry. They protest. They survive by being all things to all people. They do what they used to and to do what they have to now. There is less and less time to do what they want to or what they believe is right. They spin more and more plates. They make cuts. They measure everything. They stay focused on people, on systems, on money, on value, on compliance on everything and anything. They hold what matters tight to their chest and run to keep up with those on road one. Progress is slow. There’s detritus on the road it’s hard to see where they are going and busyness becomes the purpose. Both roads seem painfully familiar but do they really, I mean really, require leadership? Last week I started a conversation about what road 3 might look like. The conversation uncovered more questions than answers. Are we clear about what we are leading toward now? Can we see the road to take us there? Are we absolutely clear about what the new skills of future leaders need to be? Are roads one and two actually the only options? Is there another way? What will it take to create the new cadre of transformational future leaders. They’ll need courage. They’ll need creativity. They’ll need enterprise. They’ll need to be let loose from “history” to create new direction. They’ll need energy. They’ll need some space on the bench. Amidst all of the questions about road three my co-traveller gave me five certainties. They’ve been occupying my thinking. “Current leaders need to make space for new leaders to emerge”. How do you make that happen? Our current leaders are as dependent on organisation as the next woman. “Road 3 isn’t really just, only or even about organisational leadership”. What form of leadership is it then and how do we develop it? “Unlike the past policy won’t be the driver”. Sure, so what will and why are so many of our best thinkers still shackled to the alter of policy direction? How do we crowbar them free? “The skills, principles approaches and service models that have served us in the past are not right for the future”. Right about that! We’re going to have to let some stuff go and make some tough choices. How do we choose? How do we let go? What takes it’s place? “We won’t see the transformational change opportunities or create the new cadre of strong leaders we want on our horizon if we only tend our own organisational gardens”. Sure, the world’s a big place. Why don’t we go see what we can find? I am interested in your thoughts and I’d love to hear your ideas. The thinking is contributing to an evolving leadership programme. I think that is post is very interesting and offers some real challenges. I certainly think that we will need to look for leadership in different places - some of the greatest leadership I see come from not people with the furthest vision but those with the largest stake. However their strategies don't look like the the managerial ones we are used to. There is something in Arthur C Clarks principle that - Any sufficiently advanced technology is indistinguishable from magic - I think that extends to technologies of human organisation and thought. We as managers still want change technologies that look like iterative developments of our existing modes of thought. I think we also confuse apathy with exasperation, many who are subject to our systems are very keen to create change they are just exasperated with the typical methods of democracy, engagement and management. I watch the same people who are bored with the question 'what do you think' get stuck in when we ask 'what will we do'? The beautiful rub is that I must then accept that, as a formal organisational leader, I won't have my own way a good proportion of the time.